In 1998, Congress amended the Rehabilitation Act to require Federal agencies to make their electronic and information technology accessible to people with disabilities. Inaccessible technology interferes with an individual’s ability to obtain and use information quickly and easily. Section 508 was enacted to eliminate barriers in information technology, to make available new opportunities for people with disabilities, and to encourage development of technologies that will help achieve these goals. The law applies to all Federal agencies when they develop, procure, maintain, or use electronic and information technology. Under Section 508 (29 U.S.C. 794d), agencies must give disabled employees and members of the public access to information that is comparable to the access available to others. In 2005, the Texas Legislature passed House Bill 2819, which extended this federal law to include state agencies, and other state-funded entities. Visual impairments – blindness, visually impaired, color blindness, etc. Nervous system impairments – epilepsy, hand tremors, etc. Physical impairments – dexterity difficulties, paralysis, use of prosthetic devices, temporary casts/splints, etc. Mouse, fingers via touch screens, keyboards, trackballs, screen readers (JAWS), braille machines, mouth sticks, adaptive keyboards, head pointers, etc. Include “Alt Text” for ALL images. If an image has text on it, that entire string of text MUST be added to the Alt Text box. Text placed on jpg/gif or other web images cannot be read by screen readers, therefore the information is not available to all users unless alt text is added. 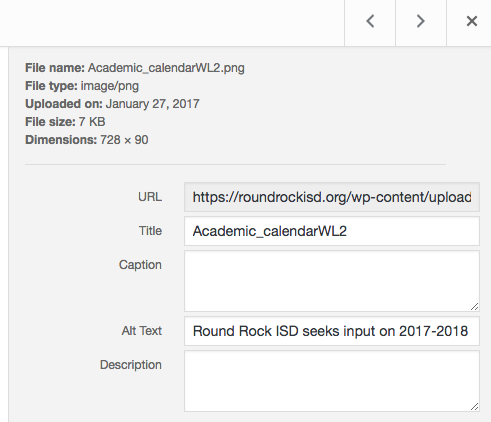 When adding the image in the Media Library, scroll down to the Alt Text field and type in ALL of the text on the image. 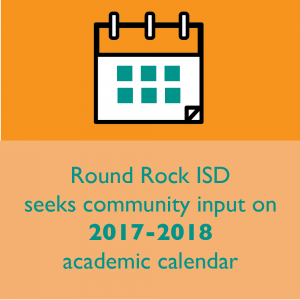 ie: Round Rock ISD seeks community input on 2017-2018 academic calendar. Do this for EVERY image you upload. Do not add screenshots of flyers, documents, etc. to your webpage. Images containing words should show just a few words. Otherwise, you have to type all content on your page. If an image does not contain text, the alt text should convey what the photo is. For example: Photo of elementary students at chess competition with trophy. Twitter/Facebook posts: If you add an image (flyers, infographic, etc) containing text/instructions to a Facebook or Twitter post, you must type in all of the written content appearing on that image in your post/tweet. The term “Click Here” and “More” do not convey what the user is linking to. Neither do full urls pasted onto the page/post. Both practices violate Section 508/ADA laws. 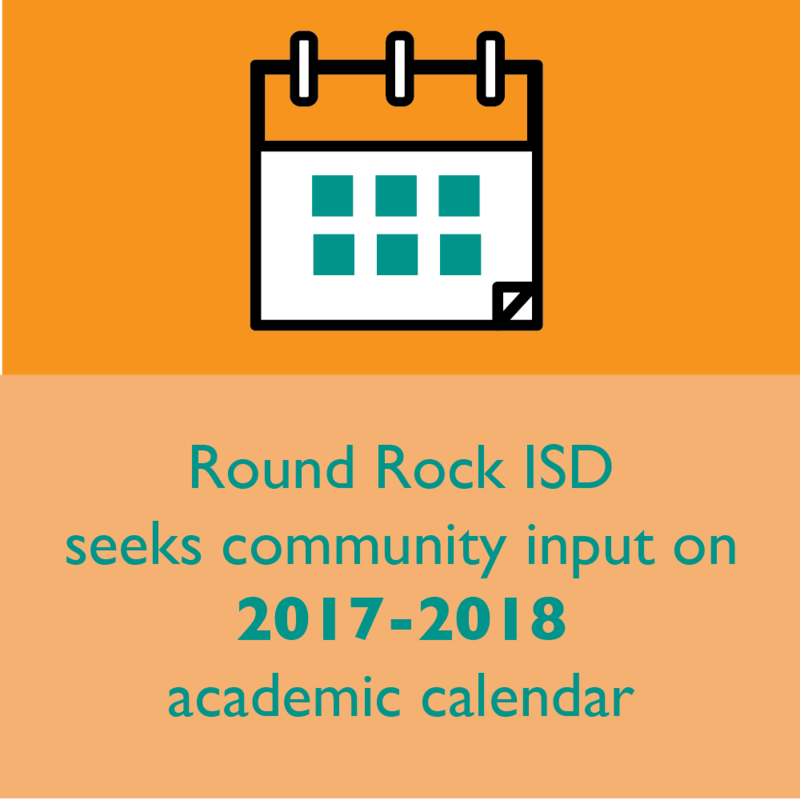 Refrain from using “click here” or “More” or pasting complete URL addresses at all times. The link should literally spell out the content of the hyperlink so that our visually impaired visitors can have the link read to them. It’s also best practice for our non visually impaired users to spot links quickly. Be sure to link/activate email addresses too. Our website DOES NOT automatically strip out custom styling from Google and Microsoft products and their code will override our custom CSS. Eliminate this by pasting your text into the Text tab instead of the Visual tab. It’s located on the top right side of your text editor. Text should be high contrast against any colored background to accommodate visitors with color blindness or low contrast vision. Never use light blue text on blue, yellow on orange, blue on green, etc. Color coding shall not be used as the only means of conveying information, indicating an action, prompting a response, or distinguishing a visual element. Never use color as a way to describe, call out or to convey certain information. Moving or flashing text is non accessible to persons using screen readers and those with learning disabilities. Flashing images/text may also provoke an epileptic seizure. So, if you do not know how to measure the frequency, it is best to leave the questionable item off of the page. If using slides or a slideshow, always add visual play and pause features so users have control over the time the slide is present. Never employ the “autoslide” function that automatically advances a slide. Provide captioning and transcripts of audio and descriptions of video. If you are creating a video, add closed captioning of what people are saying. This allows our deaf community to access information. This technique is being used more and more, not just for ADA compliancy, but on social media to draw viewers to a video and to keep them from scrolling past it. YouTube offers a built in closed captioning option.